Definition and Summary: On March 1, 1845 the United States Congress passed a "Joint Resolution for Annexing Texas to the United States" and Texas was subsequently admitted it to the Union as the 28th state. The Texas border dispute with Mexico quickly led to the Mexican-American War during the presidency of James Polk. Definition of Annexation: Annexation means adding or incorporating a territory previously outside its jurisdiction as in as, the annexation of Texas to the United States of America. 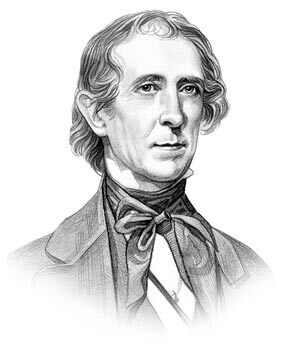 John Tyler was the 10th American President who served in office from April 4, 1841 to March 4, 1845. One of the important events during his presidency was the Annexation of Texas. The application of Texas Annexation and its admission to the Union was supported by the slave states of the south. As a part of the Mexican Republic Texas had been free soil but, as the climate was well suited to production of the cotton plant, and it would surely be admitted as a slave state. The issue of admitting Texas to the union first came before President Andrew Jackson. Jackson knew that the admission of Texas would be strongly opposed by the slave free states of the North, so he did not press the issue. President Martin Van Buren had not opposed the acquisition of Texas but did nothing to aid annexation. President John Tyler did take action and under his direction a treaty was draft providing for the admission of Texas to the Union, but the Senate refused to ratify the treaty. The Texas Annexation President John Tyler preempted James Polk on the issue of the Texas Annexation by drafting the proposals on 27 February, 1844 and presenting the bill to annex Texas on March 1, 1845. Before Texas was actually admitted Tyler had ceased to be President, but James Polk continued to support the policy. Texans approved of the popular bill which was signed by President James Polk on December 29, 1845, admitting Texas as the 28th state of the Union by joint resolution. The Annexation Facts and Timeline for kids is detailed below. The history of the Annexation is told in a factual timeline sequence consisting of a series of short facts providing a simple method of relating the famous people and events surrounding the Annexation of Texas. Texas Annexation Timeline Fact 19: June 15, 1841: Sam Houston issues proclamation declaring armistice between Mexico and Texas. Texas Annexation Timeline Fact 30: December 29, 1845: President Polk signs the Joint Resolution admitting Texas as the 28th state of the Union. The info about the Texan Annexation provides interesting facts and important information about this important event that occured during the presidency of the 10th President of the United States of America. The Republic of Texas had claimed land up to the Rio Grande based on the Treaties of Velasco, but Mexico refused to accept the Treaties of Velasco as valid, claiming the border as the Nueces River. The border disputes caused the outbreak of the Mexican–American War. The Mexican–American War was a military conflict fought between Mexico and the United States from April 25, 1846 – February 2, 1848. The war ended when the 1848 Treaty of Guadalupe Hidalgo was signed which established the southern boundary of Texas at the Rio Grande. The article on the Texas Annexation provides an overview of one of the Important issues of his presidential term in office. The following John Tyler video will give you additional important facts and dates about the political events experienced by the 10th American President whose presidency spanned from April 4, 1841 to March 4, 1845.